Can you even believe it? 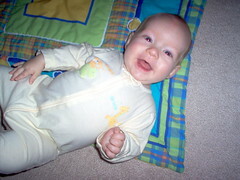 Tobin Lee turns five months old today. (I actually didn't remember/realize it until about 2pm today, after a busy morning of oral arguments at the court . . . even though I've been waiting for the date for a few weeks now.) I suppose six months will be a bigger milestone since he'll probably be trying solid food and sitting up. Plus it's half-way to the big one-year. But for some reason, five months old sounds so much older than four months old to me. 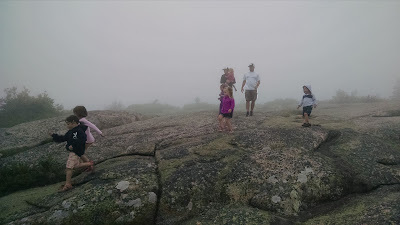 Recently, a friend asked me if it felt like he was growing up too fast--whether I was mourning him becoming less and less of a "baby" each day. It's a mixed experience for me. Matt and I often remark how we hardly remember our life (and home) before him. But then it's seems not too long ago that we felt him kick inside my belly for the first time. I was a little sad tonight as I was nursing him and thought about the fact that I really only have about one more month of my milk being his only nourishment--a loosening of a certain, exclusive bond we have. But there are so many upsides to him growing older. I feel we get to know the little person he is a little better each day. And that's so much fun. It's great to feel like we actually communicate well. He "talks" a lot now. We can't even imagine what's going to come out of that little mouth once he starts using words. Very important, entertaining things, I'm sure. 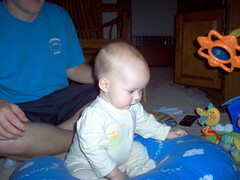 His timing always impeccable, Tobin rolled from belly to back for us tonight and practiced sitting up. Even more precious were the smiles and squeals we got during our family time this evening. We are incredibly blessed people, Matt and I, and our little Tobin counts as the greatest of our blessings. Tobin turns five months old next Wednesday. Allison already noted below how he's grown physically. Even more amazing than his phsical development, though, has been the emergence of his personality. He's a happy baby who can appreciate quiet time and loud playtime. He has recently discovered the joy of bouncing on the bed. I hold him under his arms and bounce him up and down. He never seems to get tired of it. I say "seem" because my biceps get tired of lifting him repeatedly before he tires of the jumping feeling. He smiles from ear to ear and sputters out giggles. 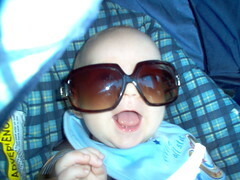 His Aunt Ashley visited this weekend and discovered that he enjoys putting sunglasses on (picture below). He, his mom, and his aunt were in the car in a failed attempt to attend the North Carolina State Fair. While they were stuck in traffic, Ashley made faces at Tobin and put her sunglasses on him. I don't know how he did it, but apparently the sound of his laughter even made the gridlock on I-40 and surrounding areas tolerable. Tobin is almost always easily consoled. I can't say he understands language yet, but he seems understanding when I explain "The bottle is warming up right now," or "I'll be glad to check your diaper." His crying is communicative, not demonstrative, for which I am very grateful. A few kids at his preschool are always loud when I'm there. Tobin, on the other hand, always seems engaged in an activity or quietly observant, thoughtful in what he is doing. 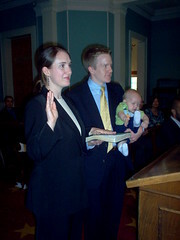 A good example of his temperament was Allison's swearing-in ceremony. I took the day off work and took him to Raleigh so we could be with Allison while she became a member of the Bar. It was held in the State Capitol, in the original Senate chamber, and was the closest thing to a formal event that Tobin has attended. I was worried about him making noise or needing to be changed while we were there. Instead, he sat quietly in my lap while other lawyers took their oaths. He would startle a little when the gallery applauded each person, but he never protested. When it was Allison's turn, the three of us stood at the podium while the Chief Justice administered the oath (see picture below). At the reception afterward, numerous people remarked that they'd never seen such a well-behaved baby. A few of the justices made a point of remarking on how handsome and well-behaved he was. And while I can't claim he's always that quiet and well-mannered, it really wasn't that surprising to us. It fits perfectly with his personality. Weight = 17 lbs., 11 oz. As noted previously, Tobin has had a remarkably smooth transition to life with both of us working. He's a big hit at his school and has even picked up the nickname Toby. (It was inevitable, was it not?) Plus, he seems to like it there quite a bit. Of course, he's at a very social age where he smiles indiscriminately--never seems to meet a stranger. And he's obviously doing okay with his eating, even though he eats about half his meals from a bottle now. I'm happy to report that he's still eating exclusively mama's milk, due in part to an awesome breast pump and a more relaxed working mom. We're planning to hold off on solids until around six months. On a more general family note, I want to thank everyone for their thoughts and prayers for us during this transitional period. For those of you who I haven't had a chance to talk to or email, I wanted to let you know that things seem to be getting better with each week that passes. While each day presents its own challenges, we are certainly adapting to and more at ease with our new routine. We're all pretty tired at the end of the day, of course. Speaking of which, I'm going to go join the sleeping boys.